Shown above: 1 Brooklyn Right Arm Sofa, 1 Brooklyn Left Arm Sofa, 1 Kane Drum Coffee Table, and 1 Waterfall Concrete Coffee Table. 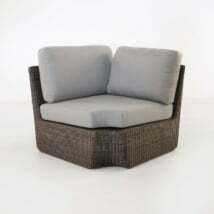 This impeccable outdoor wicker furniture collection is a brilliant contemporary wicker collection with clean lines, deep seating surfaces and a tight weave. 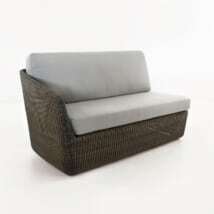 The synthetic outdoor wicker body covers a lightweight powder-coated aluminum frame. This combination of materials makes the Brooklyn an exceptionally low maintenance collection and one which will last for many years as the style subject of your outdoor space. The deep brown color is a gorgeous tone called Dark Mocha. 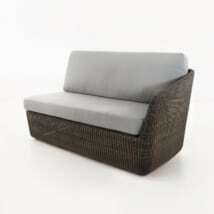 The same furniture set is available in a darker shade called Charcoal. The Brooklyn is a modern look, contemporary flair and high-tech materials combining to deliver an exceptional seating experience.